Don’t get me wrong, this year has been amazing so far, but where in the heck did it go!? I can’t believe it’s summer… and officially wedding season. Hands down some of my favorite life memories have been seeing my closest friends get married. I loved their weddings SO MUCH. They are weekends I wish I could recreate again and again. 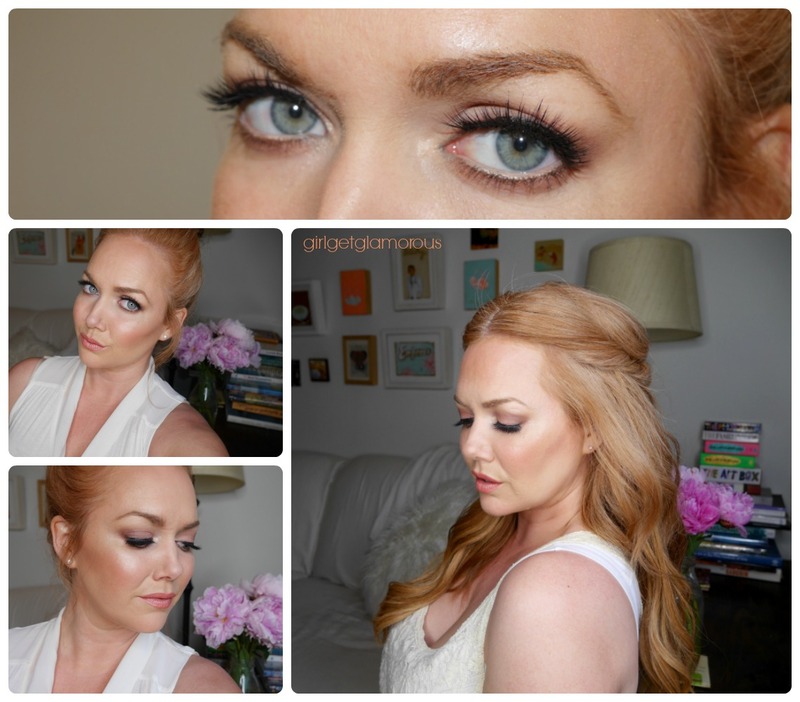 I love this makeup look for brides, bridesmaids, or anyone who wants a soft, romantic look for a night out. This is a much longer video than I normally do, but I wanted people to be actually able to do their whole face from start to finish after watching it. I go step-by-step from a bare face to the finished look. The key elements to this look are: 1 – glowing skin that also lasts from morning until night, 2 – a pop of mauve in the eye, 3 – soft peachy pink cheeks, and 4 – rosy lips that won’t budge through kisses, food, and drinks. Here is the video, I hope you love it! I listed each of the products and exact shades that I used below, just click right on the name for the direct link. As always, don’t feel like you have to use the exact same product as me, just look for similar shades in what you already have! And feel free to ask for dupes if you need suggestions. I am wearing my 18″ 180 grams set in shade 28, Strawberry Blonde from www.girlgetglamorousHAIR.com in this video. Close up of finished look! Thank you so much for reading and watching! I hope that the video is helpful and clear, please feel free to ask any questions that you have below, someone else might be wondering the same thing!! Just watched your YouTube bridal tutorial! As usual, you were fabulous! We share the same opinions about product performance, so even though I was a pro makeup artist for years, you are one of my favorite sources for staying current. I’m doing my niece’s wedding makeup in September and I’m going to try the Skandinavia setting spray you used. Thanks for helping me stay current. There’s only so much money I can spend trying new stuff (already a VIB Rouge!) and I REALLY appreciate your product reviews, lack of pretentiousness and sense of fun! Luv ya, Molly!